After an amazing time on the John Muir Trail, Zan and I were in search of an extended adventure that included a challenging thru-hike. 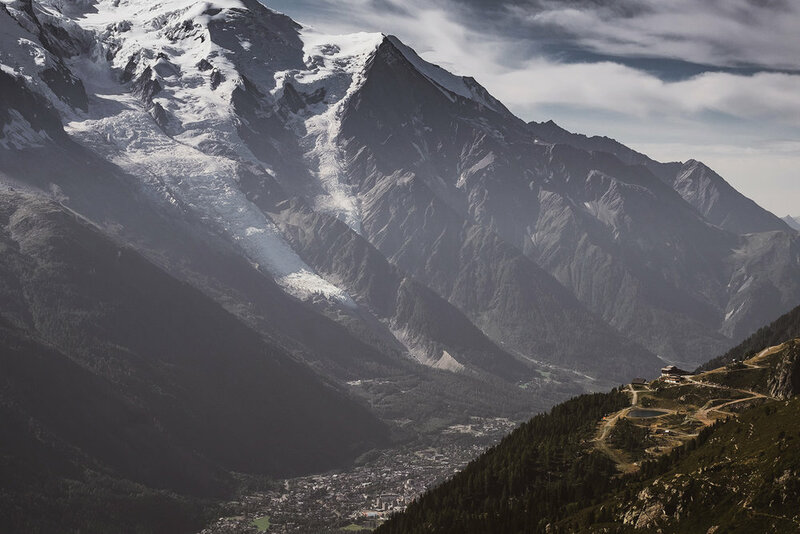 We’d heard murmurs about a trek around Europe’s highest peak, Mount Blanc. It featured the stunning French, Italian and Swiss Alps with opportunities for hot showers, warm meals and soft beds along the way. 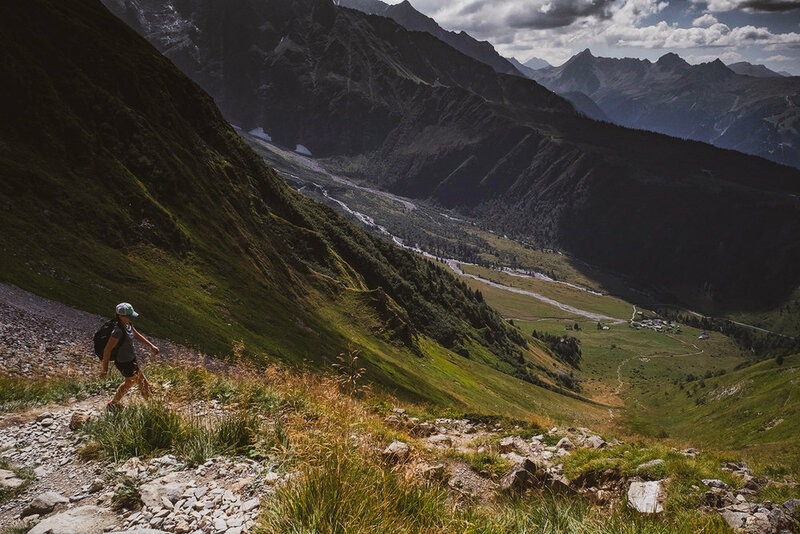 And that is how, in the fall of 2016, we found ourselves on the 110 mile Tour du Mont Blanc trail. Our trek began midway through a seven week trip across Europe (more blogs coming soon!) We arrived in Chamonix, France for a few, plush days in the world’s fanciest basecamp, then waved goodbye to our historic chalet as we boarded a bus to the nearby town of Les Houches to begin the hike. We followed a collection of color-coded signs up and out of civilization and slowly, then all at once, found ourselves high above the valley surrounded by glorious, alpine views that stretched to infinity. For lunch, we carved a winding descent to Refuge de Miage where we handily consumed all of their dessert because, well, calories don’t exist on a thru-hike. 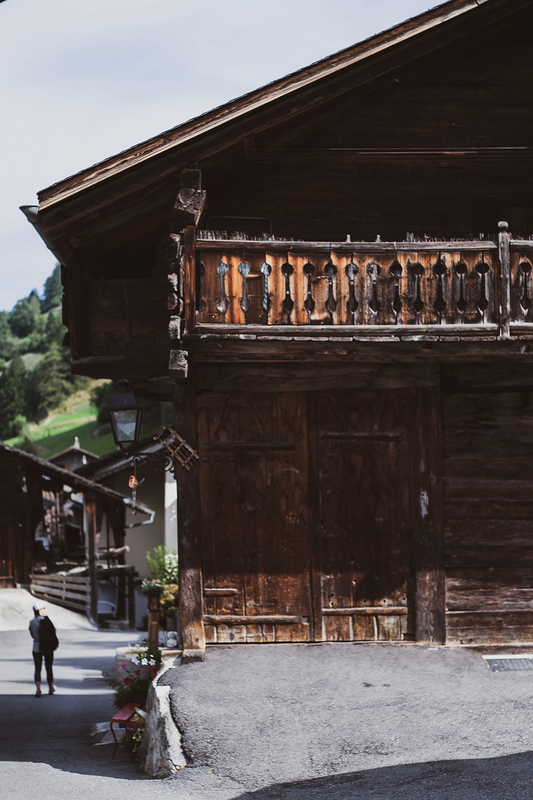 Riding our sugar buzz into Les Contamines, we arrived at our room for the night — a historic, lovingly restored farmhouse once used for sheltering swine. Good news: the renovated home was immaculate and picturesque. Bad news: dinner was a bust as we failed to negotiate French menus and settled for store-bought potato chips and hummus. Luckily, we woke to a full, fireside breakfast complete with homemade nutella for which we generously lavished oohhh’s and aahhh’s. Happy and full, we set out for day two. Our second day of hiking followed meandering brooks flowing with a milky-teal colored water. We hit a big climb early in the morning, crossed an ancient stone bridge, then traversed a beautiful valley to a refuge near Col du Bonhomme. We carbo-loaded with abandon before noticing the hundreds of wax-covered wine bottles that were used to illuminate the shelter once the generators were turned off at dark. If it hadn’t been for dorm style bunks and community bathrooms, we might have stayed for an unforgettably flickery evening. Instead, I stole a quick nap in the sun while Zan photographed the inspiring panorama, then we hiked on to our next stop at les Chambres du Soleil. Dirty and a little damaged, we washed our bodies and clothes in the shower then joined the other guests for a family style dinner in the main dining room. We shared a table with two ultra distance athletes from the UK as well as a group of Parisian day trippers who arrived by car. The magical evening was aptly capped when our host offered his family’s homemade genever, a botanical spirit made from local juniper berries. Sated after such a generous meal, it was clear that even with — or perhaps because of? — the daily creature comforts, the hike was going to be more rigorous than we imagined. And that is how, only two days into our TMB hike, we decided to drop pack weight. “Wow, you really are des montagnes!” he declared. It seemed funny at the time — why would we travel all this way and not hike the whole thing? But somehow just knowing that we could cable car / helicopter tour / high-def YouTube much of the hike, it grew harder to justify walking all the miles, especially once our bodies started saying mean things to our brains. Egos checked, we got an early start for our miles to the magnificent Col de la Seigne. That afternoon, we crossed the invisible border into Italy, traversed a scenic valley then trudged halfway to the heavens for lunch at Rifugio Elisabetta. “We are of the mountains” became an anthem propelling us up and over the steep ascents. 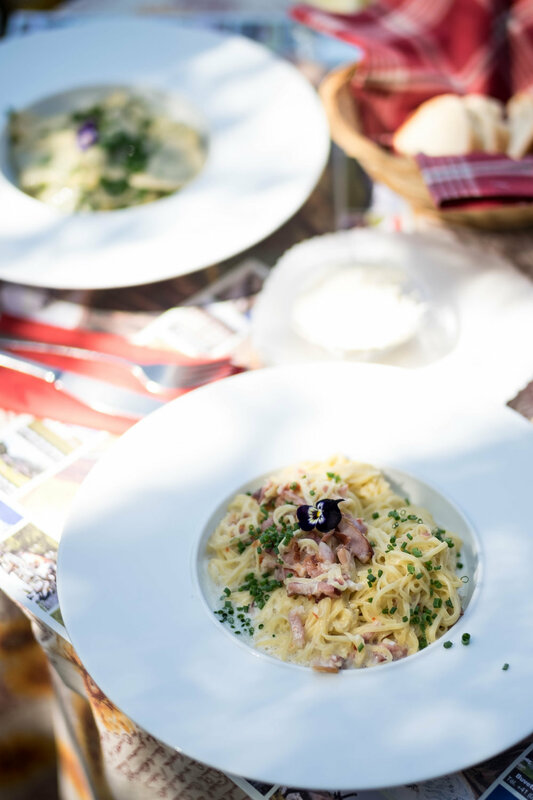 Thankfully, delicious homemade Italian pasta, soup and bread quickly changed our mantra to #worthit as, stinky but satisfied, we continued winding our way to Courmayer. The last leg of our big day followed a sketchy section of highway that left us almost as disoriented as seeing our accommodations for the night. 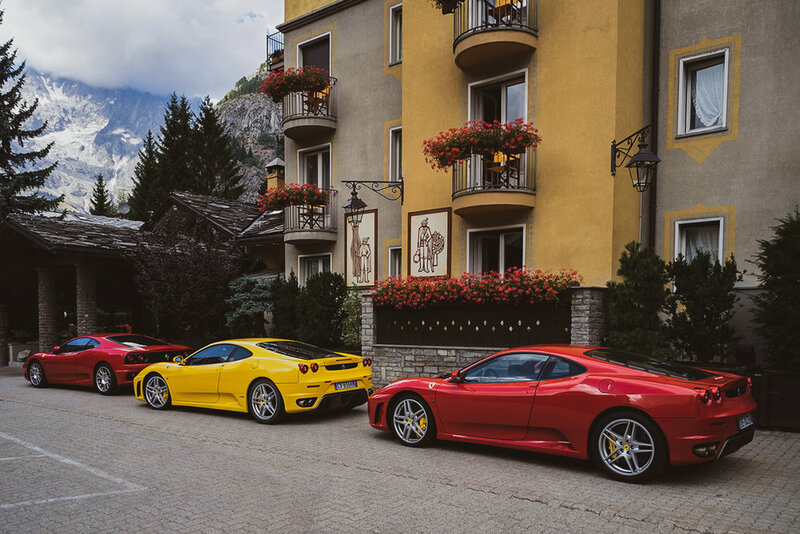 When we finally reached Hotel Bouton d’Or we found it enveloped by a full set of ketchup and mustard-colored Ferraris. We apologetically checked our dirty bodies into the cleanest hotel in the universe then promptly showered, dressed, and made our way to dinner. Just down the street from our hotel, we spotted a tiny Italian shop where we proceeded to keep the proprietor busy by eating our weight in potato pizza. On Day 4 we were greeted with the most amazing breakfast spread ever. Stations of sweet and savory spanned rooms which rapidly filled with racers for the start of the 2016 Ultra TMB. We hadn’t planned to be in the midst of a world-class ultra but luckily our route took us in a different direction than the race course. We politely shimmied our way through the crowds, leaving Italy and the announcers behind, turning toward, then over, the breathtaking alpine pass of Col Ferret. Descending into Switzerland, we reached Hotel Edelweiss and traded our muddy shoes for plastic clogs then cleaned up for dinner. Fortunately, (or unfortunately depending on how you look at it) we were carrying all of the gear (laptops, cameras, etc) and clothing that we brought with us for seven weeks in Europe. While the extra pack weight was generally a drag, it was nice to feel fancy in our fine denim at dinner. The next morning we swiftly grabbed an early breakfast and left the hotel with a scant half-day hike until our next stop. We hiked quietly through an ancient, pristine Swiss village called Praz de Fort excited to reach our accommodations for the night. Having booked our stays ahead of time, we needed to make our miles each day to avoid cowboy camping under the stars but with less than ten gentle miles to cover, the day revealed itself to us like a gift. Our short day was made sweeter by the promise of a home-cooked meal. Our half Swiss / half Sicilian hostess graciously opened her home to us and we spent our time together bonding over a mutual passion for food, travel and art. Upon sharing our post-TMB plans, she expertly recommended seeking out Nero d’Avola once we made our way to Sicily. Lying in bed that night, a breeze blowing softly through the trees, I was overcome with gratitude for the special humans that have opened their hearts and homes to us over our years of wandering. 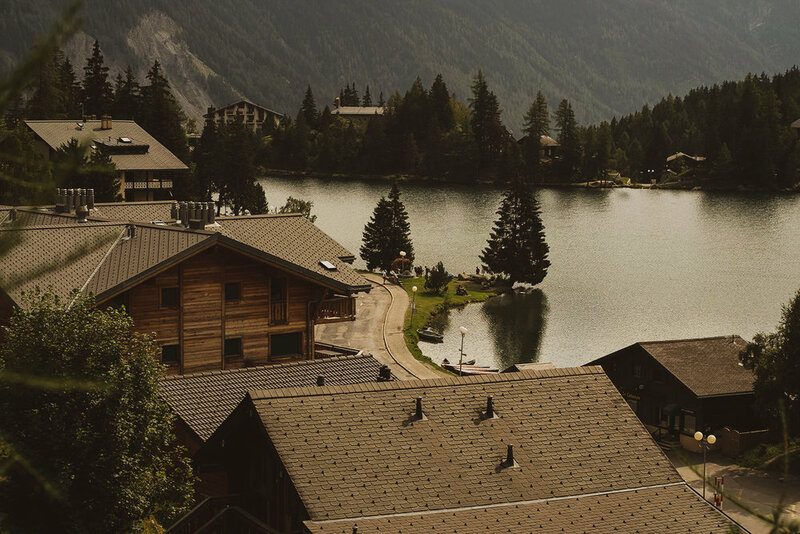 We relished in a private breakfast overlooking a charming alpine lake situated in the center of a charming alpine town. Rested and well fed, we made great time to Col de la Forclaz where we dined at a roadside restaurant for lunch. We arrived with black feet and sore knees but that didn’t stop us from twirling our fancy pasta and devouring our raspberry tart with delight. An espresso for the road was all we needed to tick off the miles to the town of Vallorcine. When we finally found the Bellevue Alpine Lodge we were surprised to learn that it was on the verge of closing for winter. We were its only and final guests for the season. Closing the doors behind us, our hosts welcomed us to wash in the immense, dorm-style bathrooms while they got to work preparing our private steak dinner. Sleep came easy and deep our last night on the trail. On our final day, we followed the road out of town, through a campground and back to the main trail. Zan’s knee had been hurting intermittently for much of the hike so we took our time passing “future frozen cable cars” to Flégère with views of Mount Blanc’s sadly receding glaciers. The last few miles were the most intense. Zan was wobbly and exhausted so I did my best imitation of a human crutch to help him reach our cabin for the night. Once he was settled, I walked back through town to a grocery store for dinner. Less than an hour later, I returned to our cabin with frozen lasagna, a baguette and chocolate dessert plus buckets and buckets of rain. The rain didn’t let up for three, long days. Back in Chamonix, we hunkered down for a few days, licking our wounds in a tiny French mountain hut, or mazot. We only dared escape our cozy cottage to restock our supply of bread and cheese or to refuel in a nearby café. Rushing through the village between giant raindrops, I couldn’t begin to imagine how difficult our journey would have been if we had to hike cold, wet and without incredible views to lure us forward. It was then that our mantra turned to a question. Are we really “of the mountain?” Could we have resisted the temptation to give up or give in under less stellar weather conditions? More than two years later, I’m still figuring out how to unpack this. Outside of being forced to race these miles, I have no way of knowing how our hike compares. What I do know is that we greeted fellow travelers, including sheep and cows and herd dogs, with all the patience and kindness our tired souls could muster. From bonjour to buonasera, we did our best to speak in their native language and, when words escaped us, we offered a friendly, universal smile. We treaded lightly, leaving nature as we found it, pristine and breathtaking, and were giddy, yet courteous guests in every home and hostel and hotel we visited. And that is how we’ve learned to move through this world — earnest, grateful and willing to sacrifice simple comforts. As for what we are, I only hope it includes incomprehensible views, the company of others having a similar, transcendent experience, and the satisfaction of doing what’s hard but good. To celebrate my 40th year on this planet, Zan and I embarked on a second month-long trek across the US punctuated by a thru-hike of the John Muir Trail. Upon descending Whitney and since returning home, several folks have asked what we would do differently. Unprepared at first, I’ve grown to enjoy this question as new answers emerge daily as we look back upon our time together. In baker’s dozen fashion — in honor of our 12 days, plus one much needed zero day, on the trail (and, well, because donuts), our thoughts are below. Like so many important moments in your life, the hike will come slowly then all at once. I would remind myself not to rush the beginning, middle, or end of the experience as each has a beauty all its own. I love that we took the time to capture this pre-hike shot looking out over Tenaya Lake hand-in-hand. Better still, I am grateful that we found each others hands during endless stream crossings and, on our approach to Whitney weeks later, that we held each other on our way to the top. While I wish Zan and I had taken more time to record special moments like the one above, I would strive to truly appreciate the grandeur that surrounded me — in the moment — including the beauty of the partner who shares in my adventures. Don’t pull into camp with your tank on empty. The first few days, we were excited and just a little freaked out. I was itching to test our limits — to know how many miles we would average each day and whether or not we’d even reach Whitney at the end of it all. During one of our first passes, Donahue, we decided to push on for another mile, mile and a half with little food in our bellies, and even less water, but an overabundance of sun exposure and elevation gain. We arrived at our lunch stop exhausted and hangry and forever lost the pleasure of all the lovely miles in between. Next time, I would know better than to ignore my body or the demands of the elements. Temper your thoughts — the dangers of the wild aren’t always as grand as you imagine them to be, nor the comforts of civilization. Find your pace and respect the flow of your fellow hikers. Having the right gear is good but hiking in the company of like-minded folks can be even more enjoyable. By Day 4, we were beginning to yo-yo with a few sets of hikers including Alejandro and Jim (above). We passed each other several times by the time we reached Virginia Lakes and, while our duos never formally merged, it was comforting to cross paths while enjoying our autonomy. Plus, the animated conversation and impromptu barters — dark chocolate in exchange for photos of their map — proved to be worth their weight in gold. Whether it be a warm shower, soft bed or a dip in a glacier-formed lake, focusing too earnestly on the rewards that await at your final destination has a tricky way of prolonging that gratification. So determined to make our miles into Squaw Lake, we failed to fully notice the storm that was brewing over the mountains and onto the exposed granite cliff. After pitching our tent in a lightning storm above 10,000 ft — surrounded by water and tumbling rock — I will do better next time to slow down and stay alert. Deal with your issues — whatever they may be — before you head off, or suffer the consequences. By the time we hobbled into Vermillion Valley Resort on Day 5 it was clear that the “toenail issue” I had been ignoring during our training hikes was not going to get better on it’s own. Instead of having it removed by a doctor, I lost more than two hours of our rest day clipping and sawing and tugging at it until it was finally extracted, root and all. Lesson? Listen to that weird voice inside your head or that rumble in your gut — they usually know what’s best. Most of your fears won’t come to pass but keep your hubris in check. So many things we worried about never came to fruition — we saw 0 bears, 0 rattlesnakes and all forest fires stayed at a safe distance as did the bubonic plague and giardia. But, we soon learned that hiking the JMT is like hiking on the surface of the sun (if the sun were also as dusty and covered in horse poo as it was bright.) Sending my sunglasses back home in an effort to save on pack weight was, hands down, the biggest mistake I made the entire trip. Each afternoon nausea would hit me like a wall and I’d have to carry it, along with my regret, up and over each pass. Next time we’ll be sure to spend a little more time getting to know the terrain and adjust our gear, and ego, accordingly. While we did our best to get our nutrition in order — a minimum of 100 calories per ounce or it didn’t get packed — reviving a dwindling appetite became a serious issue by Day 7. Next hike I will tell myself, “Now is not the time to freak out over preservatives or artificial flavors. Now is the time to get calories and water into your dirty, smelly, hungry body. Liquid calories are golden.” When your appetite is all but lost, the best calories are the ones that you can actually stomach and that is how a bag of Flamin’ Hot Fritos saved my life. Shout out to Alyssa (aka Bright Eyes) for sharing bits of her bucket at MTR. Surprisingly, they were the only thing that I could choke down and comprised a bulk of my diet for the next four days. You are stronger than you think — don’t place limits on what you are capable of. While I’m not afraid of heights, per se, I was very afraid that I’d be afraid of them once I was too high to change my mind. Thankfully, hanging out on the JMT / above 10,000 ft, the rewards found in the landscape have a way of constantly nudging you further from the safety of your comfort zone. My advice to future me? Don’t fight it. Instead, take this chance to conquer your fears. On the eve of Day 10, the landscape forced us to pitch our tent less than a foot away from a 40-foot drop. While it would never be my first choice, the dazzling sunset we witnessed from our perch had a way of making the jitters more than worth it. To do two things at once is to do neither well. If you have planned for a gradual, leisurely thru-hike then by all means bring the deck of cards or a good book and consider yourself lucky to have the best of both worlds. That said, if you are trying to make your miles to meet a stretched goal, make peace with the idea that you likely won't be filling up that sketchbook, photographing every sunset or fishing every lake. You really can't do both well so choose one adventure and focus. They were right, the early bird does get the worm. Get up early. Like, super early, and get on the trail while the Earth and it’s creatures are either just waking up or bedding down. Remember the mornings you dressed and ate in darkness then slid out of the tent to take your first steps by the smallest morning light? It was magical and you should do it more often. Bonus Tip: Hikers that aren’t stuffing in 20+ mile days are often finished and taking all the best camping spots by 3 or 4pm. Allow yourself to stop early and get a good spot for once, dammit. Always remember that great article on going lightweight and fast packing the JMT. Even if your mind and spirit are willing, at some point, be mindful that your body may start breaking down and paying the price. As the article above says, the human foot is simply not engineered to sustain this kind of activity. Lest you forget the lesson, refer to the image above where you had a fresh toe hole, Alyssa would have her third ingrown toenail surgically removed and Zan’s feet had turned into dog pads along the way. Pro Tip: Keep your feet clean and dry when you hike but lube those puppies up and shove them into fresh socks as you sleep. Otherwise? Ground. Meat. Leave plenty of room to recover and settle back into normal life. The ascent to the highest point in the contiguous US is long and challenging and you’d be wise to have your power song at the ready. Likewise, the 6,500 ft descent back down to the world is equally demanding — not because you need to plan for that hitch to your hotel (thanks for the ride, you turkey), that first trip to the laundromat looking homeless or your first noisy, crowded restaurant. And yes, sitting in a chair will never feel quite so good, a cold beverage will never taste as refreshing and a hot shower and soft bed will be heaven. But the return to life will require a bit of time and space. Give yourself enough then give yourself a bit more. In preparation for our much anticipated thru-hike of the John Muir Trail, counting calories per ounce has become a part-time job. Since many nights will be spent at or above 10,000 ft, we have opted to take a little extra time to prepare a quick, hot meal on most mornings. Egg crystals, anyone? Luckily, we’ll have a few hot meals our first week on the trail as we pass through Tuolumne Meadows Grill, Red’s Meadow Mule House Cafe and Vermillion Valley Resort. The rest of the time, we will be eating our hot meals at lunch (vs dinner) to avoid attracting unwelcome critters into our campsite. To fill in the nutritional / motivational gaps in our diet, our snacks are as calorie dense and diverse as we could make them. While we tried hard not to sacrifice quality, we’ve learned firsthand that the best calories are the ones you can stand to get into your body — high five to the ever reliable Peanut M&M! With 20+ miles and thousands of feet in elevation change per day, we are a bit unnerved that our total calories barely break the 2,000 to 3,000 mark. That said, we look to our lightweight packs to help offset the potential deficit. Of course, should we wake to the sounds of our empty bellies echoing through the Sierras, we do our best to remember that John Muir "...arrived in the Chilkat Valley in 1879 in a tweed jacket with some biscuits stuffed in his pocket."